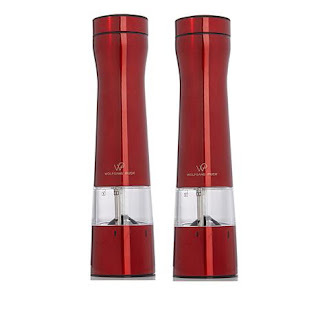 I LOVE these Wolfgang Puck Electric Spice Mill Duo with Adjustable Grinders ONLY $24.95 (Retail $39.95)! FlexPay options available. Great colors to choose from!!! Savor the flavor of freshly ground spices. Designed for one-handed operation, these mills allow you to stir salt, peppercorn or other spices into your meals as you cook. Acrylic chambers and built-in lights let you see how much spice you have left and how much is coming out. Simply turn the dial on the bottom to adjust the coarseness, then grind, mix and enjoy!